Astronomers have detected traces of an organic compound known as methyl chloride around a group of young stars. The discovery comes as a complete surprise to scientists, but instead of signifying the presence of alien life, it’s forcing them to re-evaluate the source of this molecule and its role as a basic building block for habitability. Methyl chloride, also known as Freon-40, is a colorless, sweet-smelling gas that’s highly flammable. Here on Earth, this organic compound is produced by industrial and biological processes, which is why astrobiologists thought it might be a good idea to search for methyl chloride in the atmospheres of distant exoplanets as a way to detect alien life. But as new research published in Nature Astronomy shows, this substance appears to be more common than we realized, showing up in significant quantities during the formation of stars. So while its use as a potential biosignature is now diminished, the new study still tells us something we didn’t know before about the environments around nascent star systems. Astronomers and astrobiologists received their first hint that methyl chloride isn’t anything particularly special when the Rosetta probe, using its ROSINA instrument, detected traces of the organic compound in the ultra thin atmosphere of comet 67P/Churyumov-Gerasimenko (67P/C-G). Now, astronomers using the Atacama Large Millimeter/submillimeter Array (ALMA) detected the gas wafting around a collection of infant stars, or protostars, in a system known as IRAS 16293-2422. 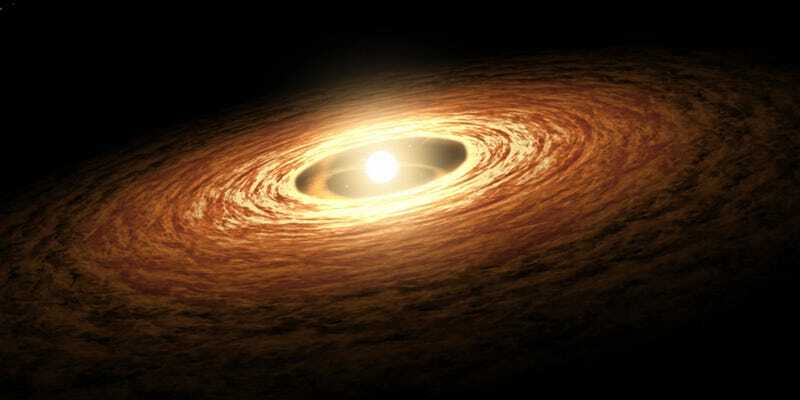 Located 400 light-years away, the protostars in this system are so young that they’re still enveloped in gas and dust. The authors of the new study, led by Edith Fayolle from the Harvard-Smithsonian Center for Astrophysics (CfA), say it’s the the first time that this class of molecule, known as organohalogens, has ever been detected in deep space. Halogens are reactive, non-metallic elements that produce acidic compounds when introduced to hydrogen, and include the elements fluorine, chlorine, bromine, iodine, and astatine. The new study also shows that organic chemistry in the the interstellar medium involves halogens, which is something we didn’t know before. As noted, scientists had speculated that the presence of this compound would be a good indicator of biological life, but now we know it’s a common component of young star systems, forming naturally in interstellar clouds and enduring long enough to weave itself into the fabric of young star systems. Indeed, because this compound was detected around Comet 67P/C-G, we also know that methyl chloride clings to comets—objects that happen to form during the primordial phase of star systems. The astronomers were able to detect the methyl chloride by taking advantage of ALMA’s molecule sniffing capabilities. This dish can detect faint radio signals emitted by collections of molecules in space. Each molecule produces its own unique spike in the radio spectrum, so like a fingerprint, scientists can match it to a particular molecule. Looking ahead, the researchers are hoping to find more traces of methyl chloride around other protostars and comets to understand how much of this substance is produced during the early stages of star formation, and how it’s disbursed.